Lama Surya Das is an American-born lama in the tradition of Tibetan Buddhism, an author of popular works on Buddhism, and a respected teacher of Buddhism in the United States. Born Jeffrey Miller, and raised on Long Island, Lama Surya Das later spent many years in India and Tibet studying with Tibetan lamas including H.H. the Dalai Lama, Dilgo Khyentse Rinpoche, Kalu Rinpoche, and H.H. 16th Karmapa. He is the dharma heir of Nyoshul Khenpo Rinpoche, a teacher in the Rime movement. 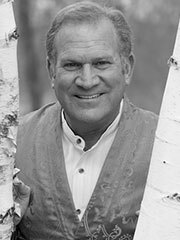 In the 1990s Lama Surya Das created the Dzogchen Foundation to further the spread of Tibetan Buddhism in the West. In 2003, at the request of Nyoshul Khenpo Rinpoche, he founded Dzogchen Osel Ling as a sanctuary, hermitage, and lineage seat in Austin, Texas. Lama Surya Das also travels and teaches throughout the United States. On February 21, 2006, he appeared as a special guest on the Comedy Central television show, The Colbert Report.